Michigan State drops two spots after struggling against Purdue. Ohio State remained No. 1 in The Associated Press college football Top 25 and tied a poll record on Sunday, despite lagging support from the voters. Meanwhile, No. 2 TCU and No. 3 Baylor edged forward, No. 4 Michigan State slipped and No. 5 Utah and No. 6 Clemson took big jumps. After four top-10 teams lost on Saturday, the rankings were rattled and five teams received first-place votes. The Buckeyes received 38 first-place votes, their fewest this season after beginning as the first unanimous preseason No. 1. TCU has five first-place votes, Baylor received 10, Utah has seven and No. 9 Texas A&M has one. Ohio State was the only team in the top 16 to have the same ranking this week as last. The Buckeyes held off Indiana 34-27 on Saturday and have now been top-ranked 101 times, matching Oklahoma for the most in the 79-year history of the media poll. One more week at No. 1 will give Ohio State a record all to itself. The most times being on top of the AP poll. Rumors of the demise of Alabama's football dynasty may have been greatly exaggerated, as the Tide obliterated Michigan State in the Cotton Bowl. Who else excelled on the big stage -- and who just fell off of it? Utah and Clemson were among six teams that moved up at least five spots in this week’s rankings. The Tigers gained six spots after squeaking past Notre Dame, 24-22 at home. The Utes moved up five spots in an off week, taking advantage of all the losses by teams in front of them. — No. 8 Alabama, No. 9 Texas A&M and No. 10 Oklahoma all gained five spots after impressive victories. 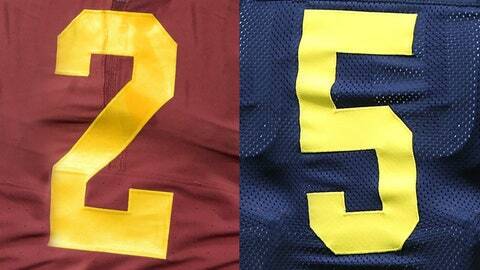 We're counting down the best uniforms in the college game. Who'll finish No. 1? — No. 11 Florida made the biggest leap forward, 14 spots after crushing Mississippi. 9 — Notre Dame from six to 15. 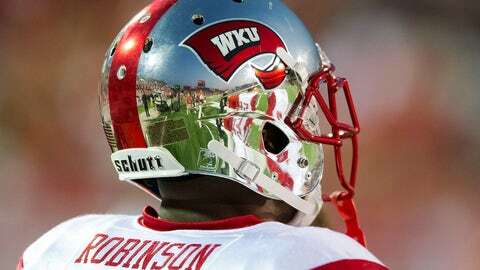 College football season is back, and so are those terrific (and hideous) uniforms. Here are the best (and worst) from around the nation. 11 — Ole Miss from three to 14. 11 — Georgia from eight to 19. 13 — UCLA from seven to 20. The Southeastern Conference leads all leagues with six ranked teams, but LSU at No. 7 is the highest ranked. 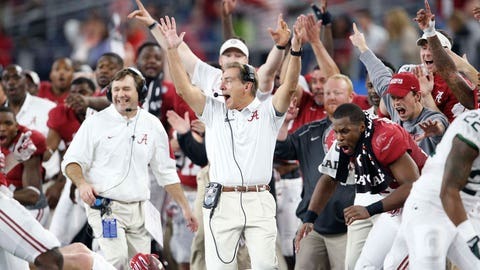 The last time the highest-ranked SEC team was that low was Oct. 10, 2010, when Auburn was No. 7. After two weeks of the Big Ten having the top two teams in the nation, Michigan State dropped two spots to No. 4. — No. 22 Iowa is ranked for the first time since November 2010. — No. 24 Toledo is ranked for the first time since November 2012. — No. 25 Boise State is back after falling out last month. Mississippi State, Wisconsin and West Virginia dropped out of the rankings after losses. — No. 23 California at No. 5 Utah. The last remaining undefeated Pac-12 teams. Just like we all expected. — No. 13 Northwestern at No. 18 Michigan. Yep, just like we expected.